If you are in the business of building mobile apps, you will know how difficult it is to design, launch and successfully monetize a new app. Although no project is a sure bet, there are a number of things you can and should do when you are building a freemium mobile app. In this guide to freemium mobile apps, we look at designing, building and launching a new mobile app; and how you can acquire new users, retain your existing users and use a monetization model to generate revenue. 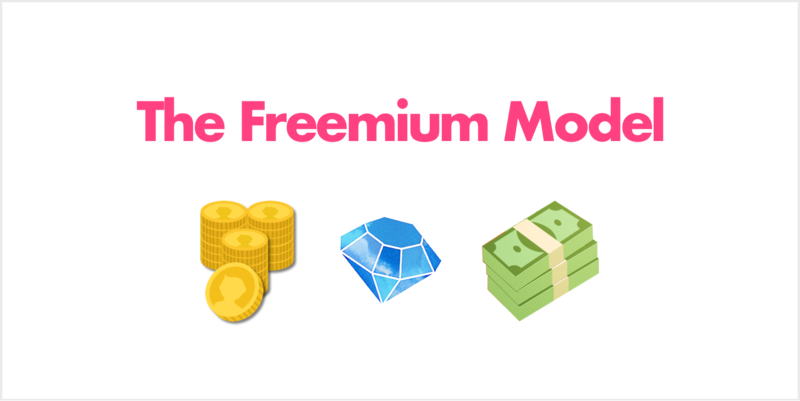 The freemium model is the most popular way to monetize mobile games and apps. In this model, you distribute your mobile app for free and generate revenue from the 0.5-2% of users that are willing to enhance their experience with in-app purchases or subscriptions. It is important to remember that the vast majority of your users will pay nothing. That is not a bad thing. The freemium model relies on these users to help your mobile app reach a wide audience. The most important characteristic of a freemium mobile app is that it is engaging and rewarding for all users, not just paying users. So it is important that any monetization features serve to enhance the experience rather than locking out free users. Since less than 2% of users will monetize, it is important that your mobile app reaches a wide audience. And since it is mostly free users that drive downloads of your mobile app, it is important to leverage this effect by designing a mobile app with broad appeal. This is even more important if you have a high cost of development. A high cost of development with a niche target audience will likely result in failure. So keep in mind that the size of your target market will ultimately constrain your product development costs. If you are building a niche app, do not expect freemium to be the path to riches. When talking about freemium mobile apps, it is useful to think about two distinct phases in an app’s lifetime – exploration and execution. In the exploration phase, the aim is to design and build a mobile app that has a product-market fit, is highly engaging and has a viable business model, most often based on the freemium model. Roughly speaking, it is all the things you need to think about and do before launch. Once you have built and published a mobile app on the app stores, it moves into the execution phase. This phase is about user acquisition strategy, keeping users retained and monetizing your audience. This distinction is not perfect since you need to think about some things in both exploration and execution terms. But it seems a good enough way to split up this guide on freemium mobile apps. When it comes to mobile apps, the monetization strategy is not something you can ‘figure out later’ (in general). So it is important you think about monetization from day one and ensure your mobile app is economically viable. Broadly speaking, you can monetize a freemium mobile app with in-app purchases or subscriptions. 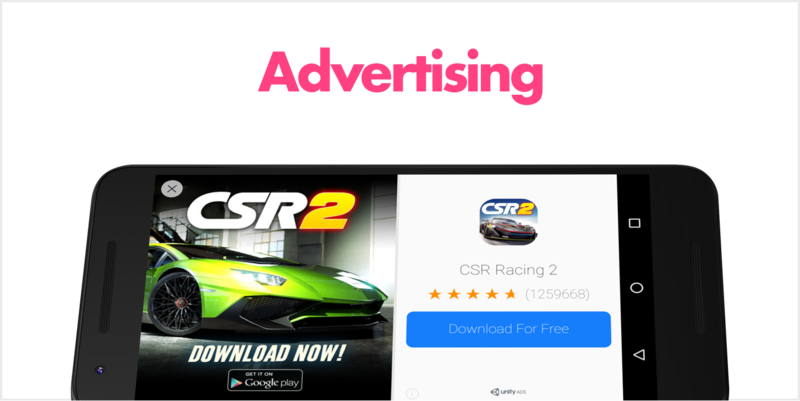 Some freemium apps will also use advertising to generate additional revenue, although this is not part of the freemium model itself. Most mobile games sell consumable or non-consumable in-app content to generate revenue. A small number of apps rely on subscriptions and this can be very profitable in apps that deliver value over a long period of time, such as dating or utility apps. In most cases, the monetization model you should use will be obvious. If you are unsure, look at similar apps already on the app stores and see what they do. The only way a freemium mobile app can be successful is if it reaches a large audience. Although many app publishers use paid marketing to drive downloads, making an app that has a viral appeal is a sure way to drive growth and cut down acquisition costs. When designing your mobile app, think about how it intrinsically drives growth. In some cases, you can achieve virality by building standard viral features like shares, invitations or gifting. Gamification can be an important tool here. For example, many freemium social games reward users for inviting their friends and the invitation mechanism is a core part of the gameplay experience. In other cases, you can leverage an existing platform like Facebook to drive growth. A photo sharing app can post a user’s photos to the Facebook Open Graph, for example. This allows the user’s friends to see their content, even though those friends are not using your photo sharing app. And that ultimately drives interest and installs. How you achieve viral growth will depend on the nature of your app. But it is an important ingredient to building a successful mobile app, so you should think about your approach carefully. 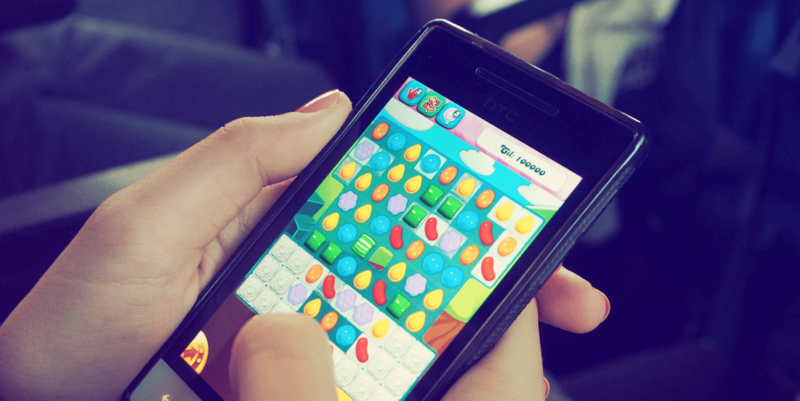 Many mobile games use virtual currencies that users can spend on in-app content. In fact, the majority of popular apps that use in-app purchases to monetize sell one or more virtual currencies to generate the bulk of their revenue. Unlike advertising or other types of in-app purchases, virtual currencies are not simply a monetization tool. They are a critical part of the gameplay experience and enable freemium games to attract and engage free and paying users. A typical game features one or more virtual currencies and various in-app stores where users can consume the currencies. Apps often sell virtual currency alongside traditional in-app purchases for consumable and non-consumable content. If you look at the most popular mobile games that use virtual currencies, you will notice a trend. They do not simply use one virtual currency, but two or sometimes three currencies. In the dual in-game currency strategy, you make one virtual currency available through in-app purchase. This is known as the primary in-game currency. Importantly, the user cannot acquire a significant amount of this currency without spending real money. Any secondary currencies are available with in-app purchase, routine gameplay, reward video and perhaps purchase with the primary currency. You can price the content that you sell in-app in either the primary or secondary currency or both. The dual in-game currency model allows you to manage the virtual economy more easily since one virtual currency has a tight coupling to the amount of money each user is actually spending. That means you can manage content priced in the secondary currency to balance progression against monetization. Dual in-game currencies can also benefit the gameplay experience since it adds an extra factor of complexity. 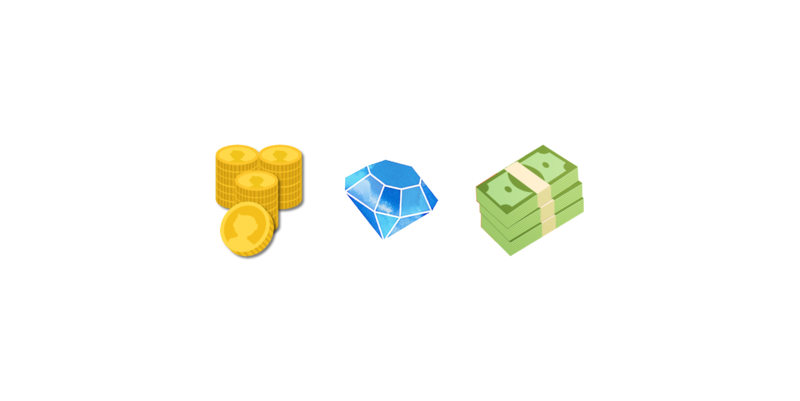 If your mobile app uses virtual currency to generate revenue, it is often best to sell the in-game currency in larger bundles. Users that have larger currency balances are likely to deplete those balances faster. That means, adjusting for the quantity of in-game currency that they purchase, they will make their next purchase sooner. Getting users to this ‘monetization hook’ is important for generating revenue. The best way to encourage gamers to buy large bundles of virtual currency is to offer substantial discounts. A discount makes the per unit cost cheaper for the user. Mobile games typically sell virtual currencies in 4-5 bundles, with per unit discounts ranging from 14% for the second smallest bundle to 40% for the largest bundle. Consumable content consists of in-app items that users can purchase more than once. Users can buy an in-app product and immediately use or deplete it. Many freemium mobile games use consumable content to generate revenue and there is no theoretical limit to how much users can spend. In theory, as long as users continue to play a mobile game or use a mobile app, they will continue to purchase these products. Since the freemium model relies on paying users to monetize over a long period of time, consumable content is a good choice for most mobile apps. For example, a freemium puzzle game can sell game hints or extra lives that users can consume during routine gameplay. Once the user fully consumes the hints or lives they purchase, the game requires them to buy again in future sessions. In contrast to consumable content, users can purchase non-consumable content once and once only. Although this puts a theoretical limit on how much users can spend, in practice a large and expanding collection of in-app products keep users monetizing over a long period of time. Some users are more likely to purchase non-consumable content since they get permanent use of the products they purchase. But it also fits really well with freemium apps that use feature unlocks or allow users to personalize their in-app experience. For example, a car racing game can sell a large number of cars that have different qualities. These qualities may directly impact the in-app experience – for example, cars may vary in terms of speed or handling. Because the freemium model requires users to monetize over a long time, it is important to sell a large and diverse range of non-consumable content. You can also generate products dynamically – the car racing game can automatically generate each car in 5 different colors, for example. In general, you should allow users to purchase non-consumable content with a virtual currency. This ensures that the purchase of non-consumable content is an important gameplay dynamic, which paying customers can enhance by spending money. Price anchoring is a technique of displaying prices of in-app content in the context of higher prices or comparable products. Using this technique can make in-app products appear good value, encouraging users to make a purchase. You will typically display your in-game currency bundles on a single paywall. This allows the user to see the prices of comparable bundles and if you order your bundles from highest to lowest, can make the smallest bundle appear good value. You can also use the price anchoring effect to illustrate discounts. If you run a time limited offer, for example, you can display the before and after price. The before price in this instances acts as a price anchor. Interestingly, the anchor effect works even when displaying numbers that are not prices. In other words, you should use big numbers over small numbers when sizing your virtual currency bundles. 1,000 coins for $1.99 is better value than 100 coins for $1.99, at least psychologically. A time limited offer is a great promotion to run and can help convert non-paying users into paying customers. The most common time limited offer that mobile apps provide is to new users. Once a user installs a mobile app, the app presents the user with a substantial discount off a starter bundle. Apps offer this starter bundle, which might provide virtual currency or consumable content, at 50-80% cheaper than normal price. The mobile app clearly communicates the time limits to the user, usually by placing a countdown timer from 48 hours to 0 hours on the start screen. This constraint encourages users to purchase and can help boost the conversion from non-paying to paying users. This kind of promotion can also help with retention. The first few days after install see a significant decline in retention. It is also well established that paying users are more likely to return to a mobile app, perhaps due to the psychological effect of loss aversion. Encouraging participation in the paying user experience is one tool you can use to increase retention. One of the difficult problems that freemium mobile app publishers face is the pricing of their in-app products. Most mobile apps launch with static prices. Every user sees and pays the same price for in-app purchases. But there is an obvious flaw with static prices. Regardless of the prices you set, you will always have some group of users that think your prices are too high. And yet another group of users who would be willing to pay more. Dynamic pricing is a tool that automatically optimizes the prices of in-app purchases to every user, which helps to boost revenue and engage price sensitive users. It is particularly useful for mobile games and apps that have users around the world because local pricing can make things more difficult. You can use a tool like Sweet Pricing which provides dynamic pricing for mobile games and apps. Apps that use subscriptions to monetize can be extremely profitable. If you have a mobile app that delivers value over a long time and has high user engagement, you should see if the subscription model suits. The freemium subscription model makes some of your app’s features or content exclusively available to paying customers. A music app might require users to pay a monthly fee to stream or download songs. Alternatively, you might make premium features available in some limited way. This approach gives free users the opportunity to try your mobile app but encourages them to upgrade when they hit the free limits you impose. To use this strategy, set reasonable limits for user generated content. A backup app might limit the number of gigabytes that the user can store or a dating app might limit each user to 10 matches per day, for example. It is usually a good idea to offer a free trial if you are using the subscription monetization model. Because you allow users to try before they buy, users are more likely to hit subscribe. If they do not cancel, they automatically move onto the renewing subscription plan. You should experiment with different trial lengths – a 7 day trial for a monthly subscription is a good starting point. 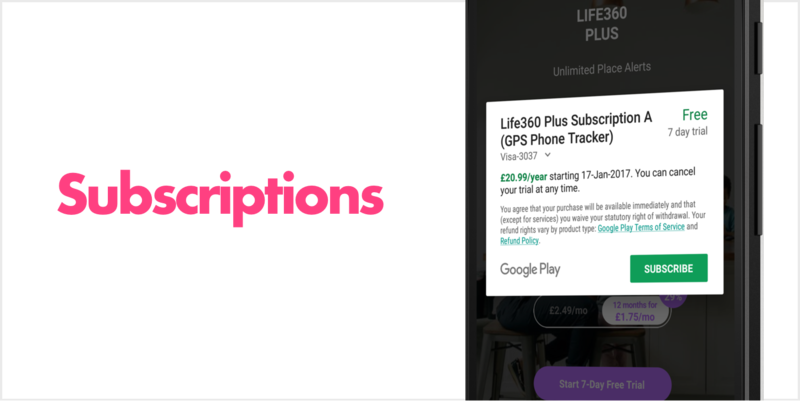 If you are using subscriptions to monetize your freemium mobile app, you will normally want users to sign up for longer term plans. Longer duration subscriptions are normally worth more in lifetime value. If a user signs up for a monthly subscription, they are free to cancel at any month before the first year. But if they sign up for an annual subscription, their minimum term is 12 months. You might find that customers on the 1 month plan stay for 10 months on average, whereas customers on the yearly plan stay for 20 months on average. If both plans cost the same per month, the lifetime value of the yearly subscriber is twice that of the monthly subscriber. The easiest way to encourage users to adopt the annual subscription plan is to offer a discount. In the above example, we can offer discounts of anywhere between 0 and 50% and still generate more revenue from the annual plan. But, you need to consider that the discount applies to users who would have bought the annual option regardless of the discount. You should experiment with being more or less aggressive in how you discount your longer term subscriptions. There will be some discount factor that will increase your revenue, but you will need to closely measure how your pricing impacts a user’s choices. You should consider using multiple subscription levels, too. This strategy packages your mobile app’s features or content into separate tiers that the user can subscribe to and switch between. Users like to have a choice and you can target your different subscription levels to specific user needs and audience segments. In a backup app, you might offer a ‘Basic’ level plan that offers 10 GB of storage and a ‘Pro’ level plan that offers 50 GB. This benefits the user because they can select a plan appropriate for their needs. But it also benefits your business because you can differentiate your offering between users, and therefore set your prices in a more targeted way. This strategy is not suitable for every freemium mobile app. But if you have features that group nicely together, or plan to differentiate with a content or use limit, it is well worth considering. You can use advertising as your entire monetization model or just part of it. If you have a mobile app where in-app purchases are not suitable, you might rely on advertising to generate all your revenue. Unless you see a very high level of engagement with your mobile app, your returns from advertising are likely to disappoint. Even if you use in-app purchases to most of your generate revenue, you should still consider advertising to supplement your revenue. You can use ad formats like reward video to give virtual currency to users that watch video ads, for example. 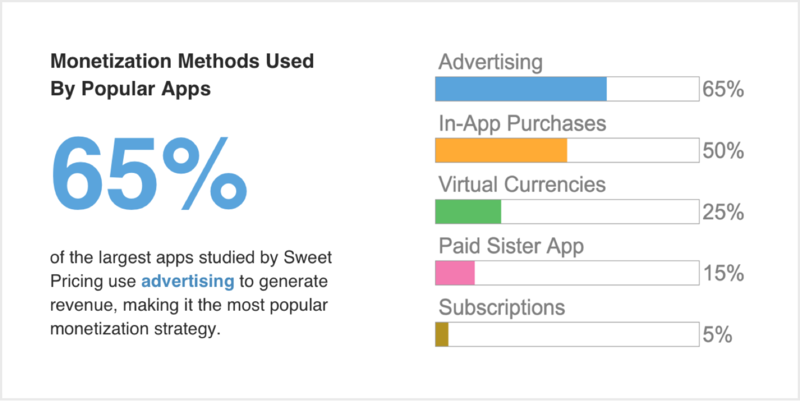 Using both in-app purchases and advertising is the most common monetization mix of popular freemium apps. Banner ads are one of the most popular ad formats for freemium mobile apps. Generally speaking, they are the least profitable format, but they are worth considering. The most common banner ad is the 320 by 50 pixel ad that mobile apps display at the top or bottom of a screen. Because they take up little space, this ad format is one of the easiest to implement. Another popular format is the 300 by 250 rectangular ad that you could show at transitional phases in your mobile app. For example, you might have a screen between levels of a puzzle game which displays the rectangular ad format. Using banner ads is as simple as signing up at AdMob and implementing a simple SDK. Interstitials take up the whole screen space, forcing the user to either click the ad or close it. Because users cannot easily ignore these ads, they tend to generate more revenue than banner ads. This ad format fits well with transitional phases in your mobile game or app. You will often see them displayed between levels of a game, for example. Restricting ads to transitional phases can be positive for user experience. Users do not see ads during routine gameplay or app interaction and the nature of interstitials prevents users becoming immune to advertisements. Video ads are highly engaging and one of the most profitable ad formats for freemium mobile apps. Many freemium mobile games use one or more virtual currencies as part of their monetization strategy. Typically, users can buy virtual currency using in-app purchases to help them advance the game or access premium content. Many games reward users with virtual currency during routine gameplay, but they can also reward users for performing other actions. Which means you can reward users with free virtual currency if they watch a 15-30 second video ad. Reward video is a great ad format because users actively choose to watch the ads and nonpaying, price-sensitive users are naturally receptive to the format. A simple way to boost revenue from advertising is to experiment with different ad networks. 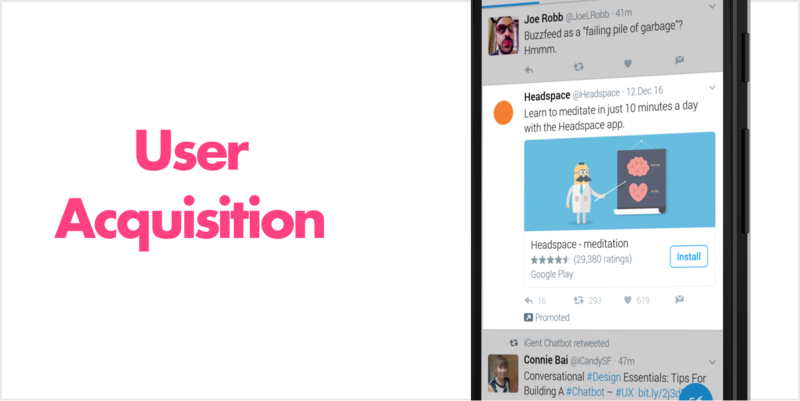 Or, even better, use a mediation solution to show ads from a number of networks. The eCPM available for mobile ads varies a great deal between ad networks and the best ad network will depend on the specific user’s country. If you fill your ads from a single source, you are potentially missing out on revenue and may see your eCPM fall as inventory dries up – this effect is known as eCPM decay. It makes sense to test different ad networks to see which generate the most revenue for your freemium mobile app. You should also consider using an ad mediation tool which can automatically balance requests between ad networks and increase your mobile app’s revenue. You should use push notifications to encourage users to return to your mobile app. In fact, push notifications often boost engagement and retention, making it a critical tool for a successful freemium mobile app. There are many different types of push notification you can send. But they broadly fit into two categories: broadcast and transactional. A broadcast push notification is a message that you send to all users or a targeted group of users. Although you can target and personalize broadcast notifications to your audience, your app does not send them in response to a specific user action. Example: a freemium mobile game might notify its entire audience of a flash sale of some in-app purchase. In contrast, a transactional push notification is a message that you send in response to a specific user action. You might send a transactional message to the user that performed the action or to a user’s friend, for example. Example: a messaging app will notify a user of any messages that they have received. The abandoned cart push notification reminds the user to complete a specific action. This type of notification encourages users to return to your mobile app and complete their action, moving them further down your conversion funnel. In most cases, you will send a message some fixed amount of time after the user leaves your mobile app. The aim is to maximize the open rate, keeping in mind that your message will have a time-limited relevance. You can discover the optimal time with A/B testing, although some push notification SDKs can automatically optimize the delivery time for you. 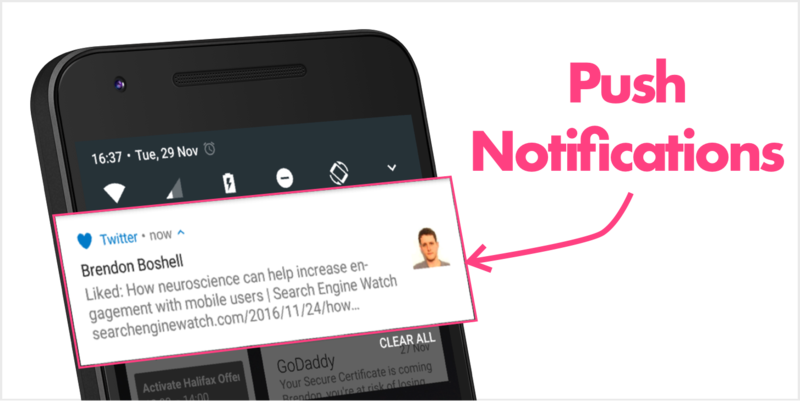 It is also important that you deep link your push notification to a specific screen in your mobile app. This makes it really simple for the user to complete their action, without having to start again. The most common example of a reminder notification is in e-commerce mobile apps. A purchase in an e-commerce app consists of multiple steps such as selecting a product, providing delivery details and entering payment information. Since users drop off at any one of these steps, a reminder notification can greatly increase the number of users who complete the purchase. But reminder notifications work well in freemium mobile apps, too. A puzzle game might remind users to complete and abandoned level, for example. A subscription app might reminder users that have viewed the paywall to complete their purchase. Using push notifications can be a great way to run promotions, helping to convert free users into paying customers. When implemented with a mobile app CRM system, you can target push notifications to particular segments of your audience. For example, you might want to offer a big discount for your in-app purchases, but only make this available to users who have not made a purchase in 7 days. 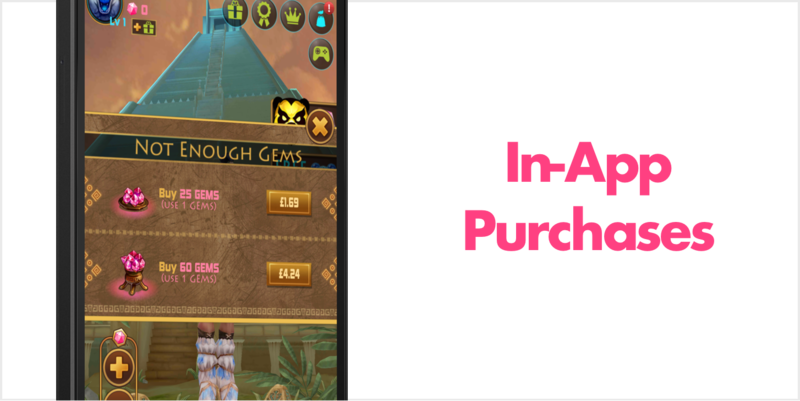 You can use push notifications to notify your audience of time limited flash sales, where in-app purchases are discounted for 24 hours, for example. This acts as a powerful incentive for users to engage with your app. Personalizing your push notifications is important to increase open rates. When you are sending broadcast push notifications, you should take account of a user’s demographic, geographic and behavioral characteristics to personalize the content of your message. For example, a freemium mobile dating app could send a message saying “there are 123 females online in London now – start swiping” rather than “there are 1 million users online now – start swiping”. In this case, the app has personalized the push notification to a user’s location and their preferences. How exactly you personalize your broadcast notifications will depend on the nature of your mobile app. So it is important to test your push notification strategy with multiple variations of the same message. A good mobile app messaging CRM will help. You need to send your push notifications at an optimal time or you risk low open rates. If you send a message at 3 am in the morning when the user is asleep, the user will likely dismiss your message without reading it. So it is important to find the optimal time of day to send your message and know that the optimal time will vary from user to user. The simplest way to optimize delivery is to detect each user’s timezone and schedule your push notifications based on this. It is not perfect, but it is a start. You just need to find the local time of day that your users are most active. The next most optimal strategy sends messages at the average time of day that each user is active. Rather than sending messages at a fixed local time for all users, you work out the average use time for each user. A simple way of doing this is to take the user’s last 10 sessions and average the time of day together. Note that you will need to take the cyclic average for this value to make sense. You can also use more sophisticated methods so it is worth using a push notification CRM that can choose the optimal time for you. You must get a user’s permission before you can send them any push notifications. You are only technically able to ask permission once, so it is essential that the user clicks ‘Allow’ the first time round. With this technical restriction in mind, it is important to time the request just right. If you optimize the delivery of the push notification opt-in prompt, you can ensure that users are more likely to accept your push notifications. There are two basic strategies. In the first strategy, you defer the permissions prompt until the user performs a particular action in your mobile app. That action should be tightly coupled to the purpose of push notifications. A messaging app might wait until the user sends a message to a friend and then ask the user to enable push notifications. Your mobile app should communicate that the push notifications will alert the user to any replies sent in the conversation. The second strategy defers the prompt until the 3rd or 4th user session, for example. This ensures the user is familiar with your app and can appreciate the value of push notifications. Asking for permission in the first session is usually a bad idea. The soft ask prompt uses an in-app dialog to request permission, before displaying the iPhone’s native prompt. Because only the native prompt has the one time limit, you can display the soft ask prompt as often as your mobile app needs. This means that you can prompt users that click ‘Don’t Allow’ in the first prompt at a later date. To use this pattern, create a dialog that requests permission for push notifications. Use this dialog to explain how your app uses push notifications, so users are more likely to click ‘Allow’. If the user clicks ‘Don’t Allow’, close the dialog and let the user continue. If the user clicks ‘Allow’, show the native prompt to the user. For as long as the user clicks ‘Don’t Allow’, you can redisplay the permissions prompt at a later date. This can increase the number of push notification opt-ins that your mobile app has and expand the audience you can reach with messages. If you can acquire new users for less than their lifetime value, paid marketing is an obvious way to grow your mobile app. Although viral features and organic promotion are extremely important, the largest mobile apps rely heavily on paid marketing. You can use a universal campaign to market your Android mobile app. This is a simple way to reach users on Google Play, Google Search, YouTube and in other apps via AdMob. For iPhone apps, you can promote your app using Apple’s new Search Ads platform. Most paid marketing platforms are cost per install, although Search Ads is cost per tap. It is important to manage costs so that any marketing campaign delivers a positive ROI. Once you start paid marketing, you should use the targeting tools that ad platforms offer to optimize your campaigns. Ad targeting ensures that your ad campaign is reaching the right users and allows you to set more appropriate bids. This can result in a stronger ROI for your entire campaign. You should use a powerful analytics tool to estimate the lifetime value of your acquired users and study how particular user attributes or behaviors impact on LTV. You can use these attributes, which may include geographic or device data, to define user segments with ad targeting tools. Generating LTV estimates for a range of user groups lets you know how much you can afford to spend acquiring users across geographies, devices, ages and other predictive characteristics. Segment your users along characteristics that have the strongest relationship with revenue. Many app publishers underutilize the media, although it can be a great way to build hype and get initial traction that a freemium mobile app needs. The best way to get the attention of larger media outlets is to offer them an exclusive on your story. Exclusives carry weight with the likes of TechCrunch and can be a good way to get much-needed media coverage. Creating a press kit is also a good idea. Make it easy for journalists to cover your mobile app by providing a kit of screenshots, photos, icons, videos and list of key features. Getting journalists to write about your new mobile app can be difficult, but the payoff can be huge. It is well worth making press and media a focal part of your user acquisition strategy in the early days. Remarketing is a way of advertising to your existing users on platforms like Google AdWords and Facebook. This method of user acquisition actually focuses on getting users to return to your mobile app. This can help improve retention over the long term, but can also further monetize paying customers by increasing their level of engagement. To use remarketing, you must collect the AAIDs or IDFAs that belong to your users. You can then use your analytics tools to build remarketing lists that filter users by some segmentation rules. One common list is of users that normally have a high level of engagement, but have stopped using your mobile app for a number of days. These users are most likely to respond to a reengagement campaign. At the heart of any analytics instrumentation is the tracking of events. Analytics is extremely important when developing a freemium mobile app. It helps you understand your audience, how well you are retaining users and how much money you are making. The insights that a good analytics strategy can produce help you develop a better product, which increases the chances of your app being a success. The first step is to think about what events you need to track from your mobile app. Common events include “user opens app” and contain various metadata about the user and their interaction, but you should think about the important questions that analytics will help you answer. Then map these questions onto a series of events that you will need to collect. You will also need to list the user static that you store with each event. If your mobile app has access to any demographic, geographic or behavior data, you should record this data with each event. It can prove extremely useful when looking a user segmentation, for example. As a general rule, it is better to collect too much data than not enough. You should consider using a popular analytics tool rather than building your own in-house solution. 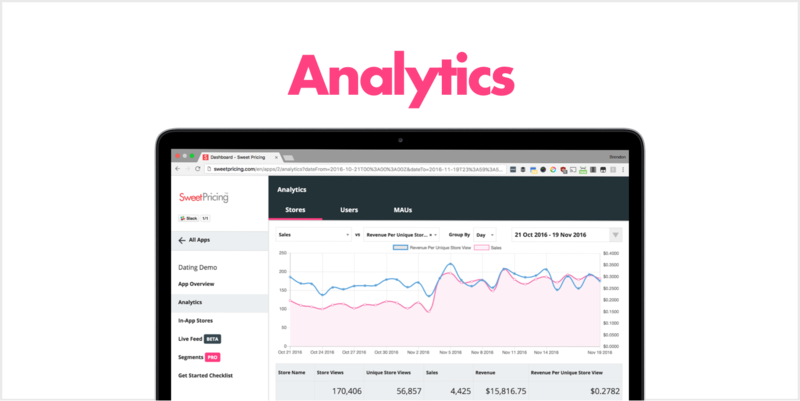 Mobile app analytics tools are extremely powerful and contain a number of essential reports that help you understand your users. Freemium app metrics, like daily active users and average revenue per user, are an important part of running a mobile app. Each metric measures how well you are achieving a particular objective. For example, you can compare daily active user figures against last week to see how fast your mobile app is growing. Key performance indicators are a collection of essential metrics that you track over time. With this view into performance, you can make decisions to correct your course and address any problems with distribution, retention or monetization. Since you already collect event data from your mobile app, you can process this data to easily generate a dashboard. Every freemium mobile app publisher should have a dashboard or spreadsheet where they can view the latest key performance indicators. DAU is one of the most simple metrics you can calculate for your mobile app. It is simply the number of users that are active in your mobile app on any given day. Because freemium apps rely on reaching a large audience, the number of users you have is one of the most fundamental considerations to a successful app. DAU is a figure that should be easily accessible on a dashboard to ensure your app is growing quickly to capture an audience. Since exposure, retention and virality all impact the number of daily active users you have, this is a metric that concisely captures growth in your mobile app. One of the most important metrics of any freemium mobile app is retention. For a freemium mobile app to be successful and reach a scale where it can become profitable, it needs to retain its users. Measuring retention and making the metric accessible gives insight into how retention is improving over time. If a mobile app is underperforming in terms of retention, all product development effort should concentrate on improving this. For each day, you should calculate your Dn retention metrics. Most common retention metrics are D1, D7, D14 and D28 where D1 means the percentage of users retained one day later. Apps usually calculate these Dn metrics for each day – this is a type of cohort analysis. But the values of these Dn figures will depend on your definition of retention. There are two common definitions that app publishers use, although many other definitions that have niche applications. Non-rolling retention is the most common calculation where Dn is the percentage of users who return to the app on exactly the nth day. Rolling retention calculates Dn as the percentage of users who return to the app on day n, n+1, n+2 or any other day in the future. It is important that you know whether your analytics tool is showing non-rolling or rolling retention before making comparisons with other mobile apps (or representations to investors!). The paying conversion rate records the percentage of active users that are paying on a particular day. It is often best to think about users as belonging to two groups: free users and paying users. Although free users do convert to paying users, most often what drives users to purchase is behavioral. When doing analysis, it is often sensible to treat these two groups independently. To calculate the paying conversion rate, simply divide the number of daily active users that make a purchase by the number of daily active users. Most apps have a conversion rate of 0.5-2%. You should not pay too much attention to conversion rate. Trying to increase this figure is normally a mistake – it is largely the small group of paying users that drive revenue, not trying to make free users pay. Average revenue per user (ARPU) and average revenue per paying user (ARPPU) are two important metrics that explain how well your mobile app is monetizing. Most app publishers calculate ARPU per day and this specific metric is known as average revenue per daily active user (ARPDAU). Similarly, ARPPU often means average revenue per paying daily active user (ARPPDAU). Some app publishers will calculate these figures per monthly active user, however. ARPU gives you a broad idea of how well your mobile app is monetizing its users. It can be slightly misleading when trying to interpret the impact that monetization mechanisms have. This is because we calculate the metric across the entire user base, rather than users that are already paying. If you are trying to understand how a change in some monetization feature impacts revenue, it is often better to consider ARPPU. There are generally other factors that impact whether a user is free or paying and you can capture that impact with the conversion rate metric. Lifetime value (LTV) is a very important metric because it tells you how much you can afford to spend on user acquisition. Although the other common freemium app metrics are easy to calculate, lifetime value is very difficult. There are a number of different estimates you can use that each has their pros and cons. You should invest time in producing realistic and reliable estimates of lifetime value before you launch any marketing campaigns. One of the reasons that you should use a popular analytics tool is because they can estimate lifetime value for you. Some tools base simple estimates on ARPU, but you can also use more complex tools like survival analysis. A/B testing is an extremely important part of freemium mobile app development. The freemium model depends on use and monetization over a long period of time, so continuous improvement and refinement are essential to a successful mobile game or app. Although it is important to release a mobile app that has good product-market fit, A/B testing can be a great way to test assumptions after you release your app. 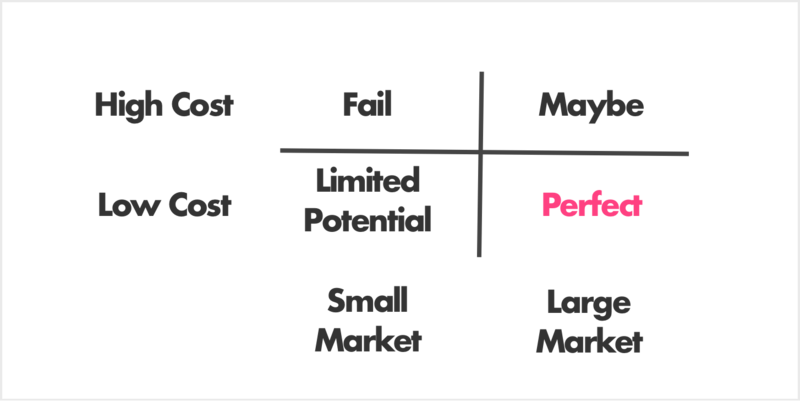 You should use A/B testing, and other sources of insight, to inform your future product development. You should use A/B testing to test how refinement to existing functionality impacts use of that feature. This impact might reflect in metrics of the frequency of use, conversion rate or ARPPU, for example. Some app publishers create their own A/B testing frameworks, but there are many SDKs available that make A/B testing very simple.